Introduced in 1941 and discontinued in 1948, the Skyline was one of the most popular pens of its era. Generous wartime production allowances played their part, but its radical styling and consistently smooth and responsive nibs made it a favorite of writers then and now. Eversharp was a pioneer in hiring well-known industrial designers (the Loewy-designed Symphony was introduced in 1948); for the Skyline, it turned to Henry Dreyfuss, whose credits included numerous icons of modernist design. Few books on Dreyfuss mention his work for Eversharp, though the connection with his other prewar streamline designs  the 20th Century Limited, for example  is obvious. This is not accidental: as this essay notes, Dreyfuss later rejected streamlining, and did his best to minimize the extent to which he had contributed to that style. Another peculiarity about the Skyline is its name. Eversharp literature often called it the "Skyliner," but if marked, the pens themselves were branded "Skyline"  the name now universally preferred by collectors. The Skyline came in three basic sizes: standard, short, and the oversize Executive. The last is quite rare, despite having been a regularly catalogued model. Skyline color and trim variations are bewilderingly diverse, making the series a natural for collectors. Interest has not yet taken off in earnest, however, and even the rarest models remain quite affordable  if they can be found. Scarcer models include those with wide cap bands, longitudinally striped barrels and caps, stainless steel or sterling silver caps, and gold filled caps in other patterns than horizontally ribbed. Skylines in smooth 14K solid gold  the "Command Performance"  are not rare, though it can be tough to find examples that are not dented or monogrammed. Many were sold during WW2, when Americans were fully employed but had few consumer goods on which to spend their earnings. 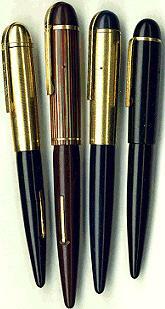 Above, from left to right: short model in black, with ribbed gold filled cap and gold filled derby; Executive in maroon, with red striped cap; standard model in dark blue, with ribbed gold filled cap; short economy "Streamliner" in black, without over-the-top clip. Most Skylines were equipped with long breather tubes, though early pens had a short, ink-wicking "tail" instead (reminiscent of the Parker "Lucky Curve" feed) made either of flat celluloid or hard rubber channel. Early pens also came with transparent sections, and less commonly, with two-tone nibs. Skylines do not have a large ink capacity, but original Eversharp instructions recommend that the lever be operated more than once while filling: for pens with a breather tube, this insures the sac will be filled to its maximum capacity.